The AdderLink X200-USB/P-US is a USB keyboard, video and mouse extender kit that supports two computers and includes a X200 receiver unit and one CATX-USB Computer Access Module (CAM). This USB KVM extender has been designed for use in applications where up to two computers can have their keyboard, video and mouse control extended up to 200 m (650 ft.) across CAT5 or higher UTP cable. 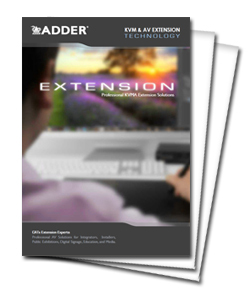 The AdderLink X200 class extender provides absolute real time keyboard and mouse performance along with hi-definition, hi-resolution video over a VGA interface. 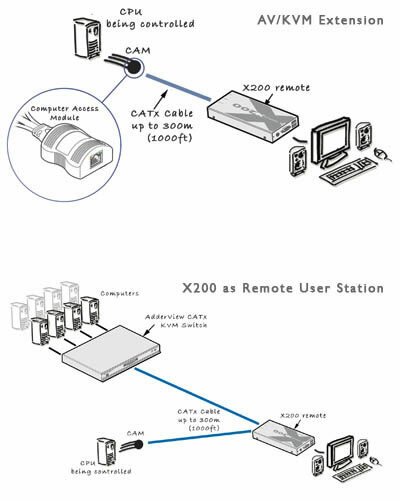 The AdderLink X200 receiver can also be used as a remote user station for the AdderView CATx range of KVM switches. The 2-port transparent link supports most common USB devices such as mice, keyboards, touch screens, graphic tablets, jog shuttles, joysticks and mass storage devices. Isochronous devices such as web cams and headsets can also be used. Each receiver is fitted with two ports to enable connection to a local and remote computer, or two remote computers. The user can quickly select between these ports using keyboard hotkeys or mouse control. Individual video brightness, compensation and skew settings can be applied to each connection. The AdderLink X200 applies 128 steps of signal compensation allowing for a great range of very smooth and fine adjustments enabling the user to adjust the video picture to their exact preference. Unless an extender actively supports DDC some well known high performance video cards cannot be used at high resolutions. The AdderLink X200 fully supports DDC. As the ADDERLink X200 supports fully transparent USB connections it is able to support all common hardware platforms including PC, Sun and MAC and their associated peripherals. the ADDERLink X200 units can be mounted into a chassis (X-RMK-CHASSIS) that will allow 16 X200 receivers units to be housed in 2U of rack space. Each receiver may be connected to one or two USB, PS/2 or Sun style computer access modules. The user can quickly select between these ports using keyboard hotkeys or mouse control. Height 6.8 in. / 172 mm. Width 1 in. / 26mm. Depth 3 in. / 75mm. X200 is also known as X200-USB/P, and X200-USB/P-US. Question: Does this include a CATX-USB? Answer: Thank you for your inquiry. Yes, the X200-USB/P-US comes with both the remote unit (X200) and one computer access module (CATX-USB). Question: looking for X200A-USB/P unit, offered thru Adder but don't see here, description... 100m extender pair, USB CAM, audio, no de-skew. If possible to order what is price including shipping? Answer: Thank you for your inquiry. It does not appear we have that extender kit on our website. We will add it within the next half hour (https://www.kvm-switches-online.com/x200a-usb-p-us.html). The individual parts that make up the kit are the: X200A/R-US (https://www.kvm-switches-online.com/x200a-r-us.html) & the CATX-USBA (https://www.kvm-switches-online.com/catx-usba.html). For pricing and stocking questions, please contact your KVM Switches Online representative directly at 1-877-586-6654 or via our online chat feature. Question: I need a data sheet for this item showing all agency approvals. Answer: Thank you for your inquiry. The PDF data sheet for this device can be downloaded from the following location: http://www.adder.com/sites/default/files/pdf/datasheets/x200_v1.pdf.